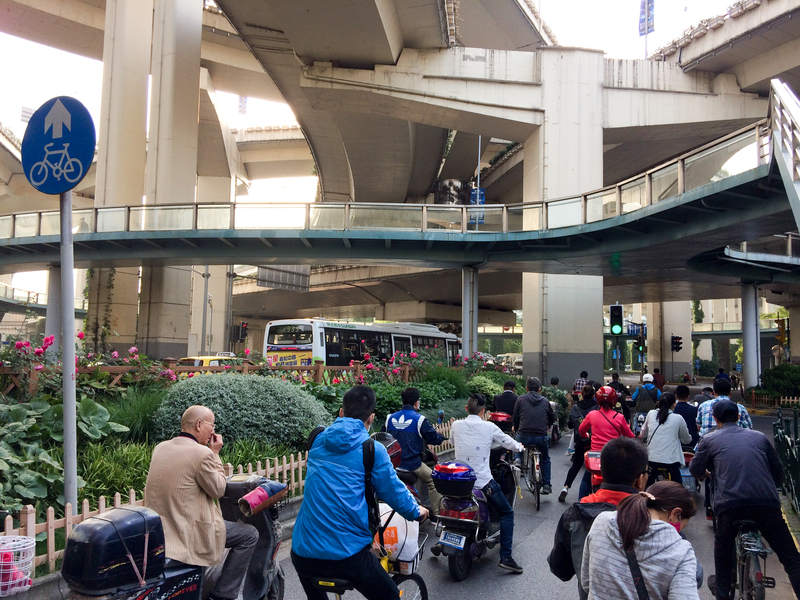 The economic growth and the urbanization of China in the last decades have put big pressure on the transportation system, public space and health in two of the biggest cities in the country. Both Shanghai (metropolitan area of about 36 million inhabitants) and Beijing (metropolitan area of about 21 million inhabitants) have extensive rush hours with increasing traffic and are both coping with air quality problems. A good starting point for another episode of the Suicide Cycling Tour: hitting the streets in Beijing and Shanghai. The bicycle is an integral part of the Chinese society. A decent amount of commuters in Shanghai and Beijing use a bike for their daily trip. For several jobs, such as street sweepers and the police, the bicycle is a very practical way of getting around. And although China goes through a rapid process of modernization, you can still spot several classic cargo bikes in the cityscape making their way through traffic, carrying almost everything. After all, the bicycle is still a very affordable means of transportation. 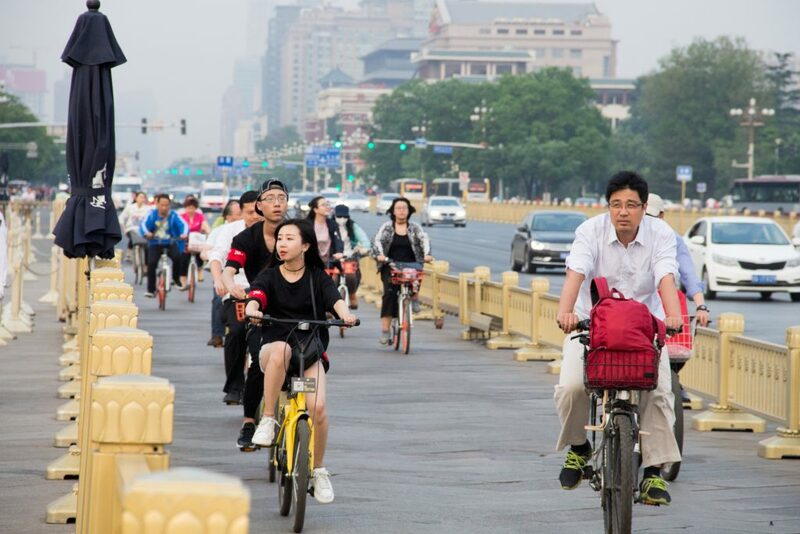 Apart from the air quality on some days, cycling in both Beijing and Shanghai is not as aggravating as one would expect from these megacities. Cyclists have had their place in traffic for a long time. Several streets have designated bicycle lanes and next to busier roads there are often parallel roads for slow traffic such as bicycles and scooters. 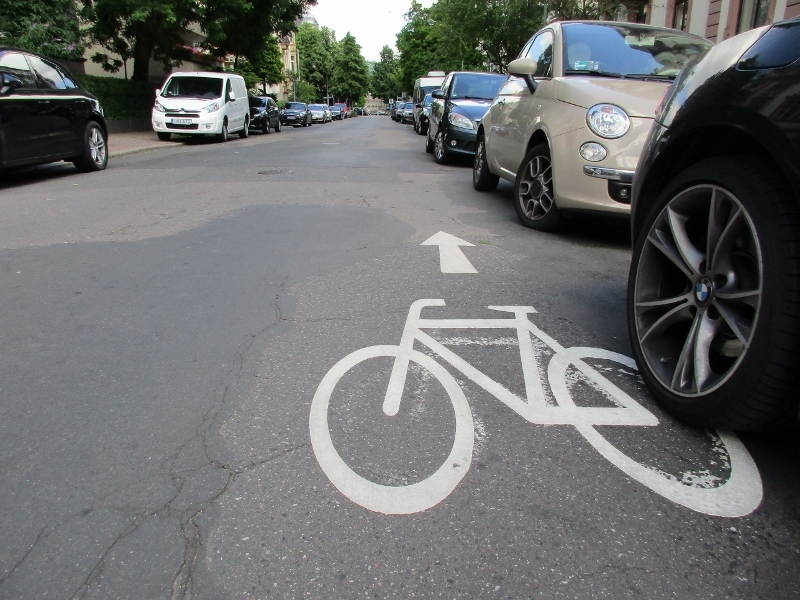 Cars usually keep their distance and if you don’t feel safe on the road, you can ride the sidewalk as well. Not as fast as riding in the streets, but it is comfortable and the pedestrians don’t mind. But it takes some time getting used to the behavior of the locals. The situational awareness of Chinese people appears to be very poor. 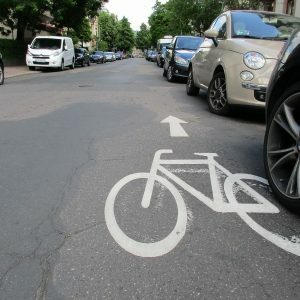 Motorists, cyclists, and pedestrians don’t seem to pay a lot of attention to the other people on the road and they (unintentionally) cut each other off quite often. However, this doesn’t cause a lot of accidents nor does it agitate people. You won’t hear any cursing, hear a lot of honking or witness the obvious menacing non-verbal communication as you would in many other cultures. None of that. People here accept the situation, take their loss and carry on. This actually creates a safe traffic flow that you just have got to get used to. And once you have, it is really an excellent and safe cycling experience. No helmet required. At the risk of sounding like the Lonely Planet, cycling really is a good way to explore Beijing. 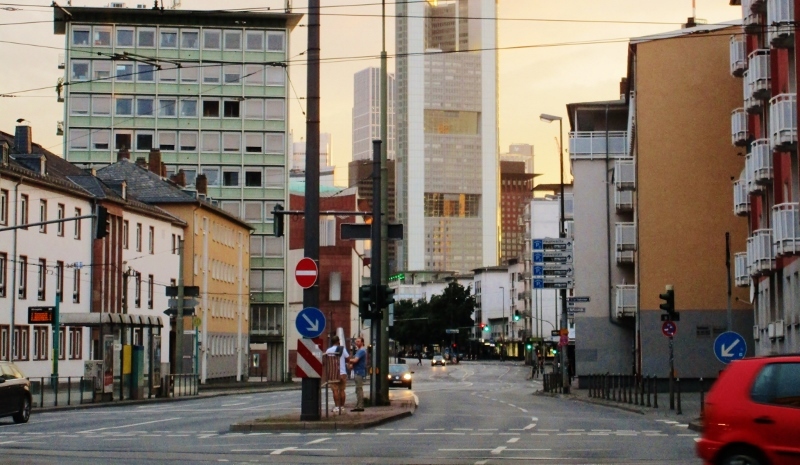 The city is relatively flat and most streets and avenues run in a clear grid pattern. The city has many destinations within cycling distance and there are many wide avenues with lanes for bicycles and scooters. The bike is an excellent vehicle to discover the narrow streets and alleyways in the Hutongs (the traditional neighborhoods). 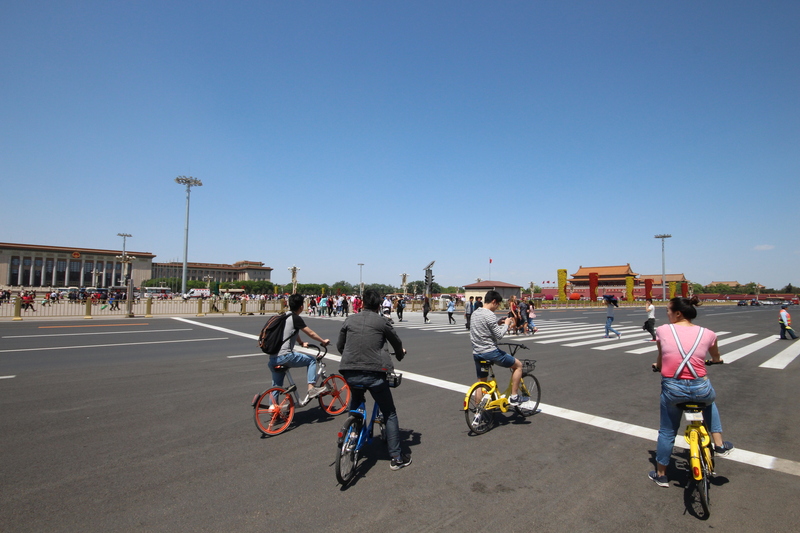 You can also cruise alongside the Forbidden City and across the giant Tiananmen Square. 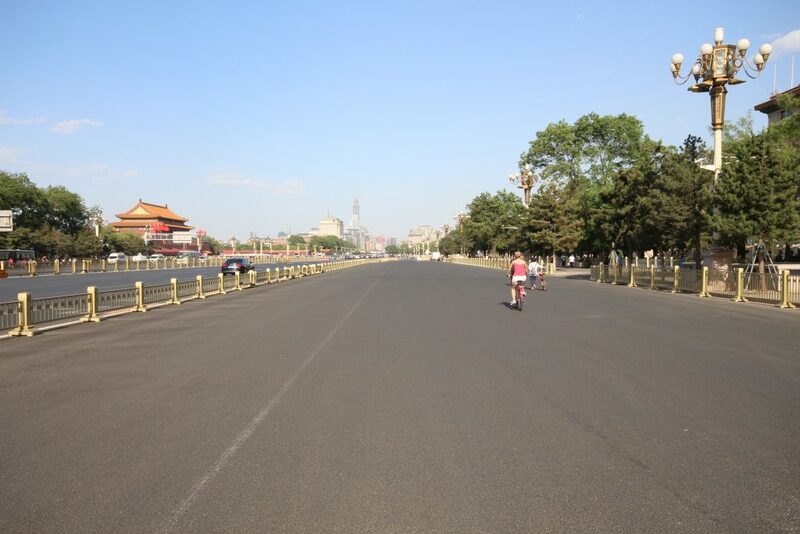 Out of the blue, just on the flanks of Tiananmen Square at Chang’an Avenue there it is: the widest bike lane in the world. What could be a 5-lane avenue, is solely a playground for bikes (and scooters). Good quality asphalt, no lines, just pure freedom. Shanghai is also very suitable for riding a bike. Less tourists here and a little more locals on the bike. West of the Huangpu river you can circle the People’s Square and enjoy the many streets. Ride in the shade of the platanus trees or in the small parks in Jing’An, Changning or Xuhui neighborhoods. East of the Huangpu river there is the Pudong district where you can cycle underneath the mega-skyscrapers of the Lujiazui Central Business District. 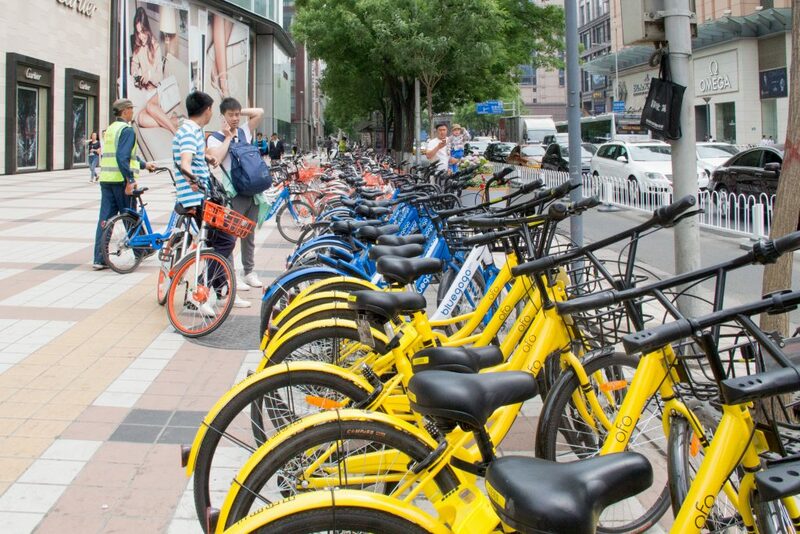 Recently Shanghai, Beijing and many other Chinese cities, have gained fame for the extensive growth of their bike sharing programs. Unlike successful bikes sharing systems such as Paris’s Vélib and London’s Santander Cycles (Boris bikes – previously featured in SCT London), the new Chinese systems don’t require docking stations. The bikes are equipped with GPS and reservations are made through an app on your phone. Low user cost and the user-friendly rule of ‘drop where you stop’ make these systems very popular. The first of such systems dates from June 2015 when Ofo started. Ofo now says it has around 6.5 million yellow bikes in over 150 cities. Its main rival, orange-wheeled Mobike started up in Shanghai in April 2016, and has currently become the market leader in China. Five million Mobikes are in circulation), and the company claims to be able to manufacture 100,000 more every day. 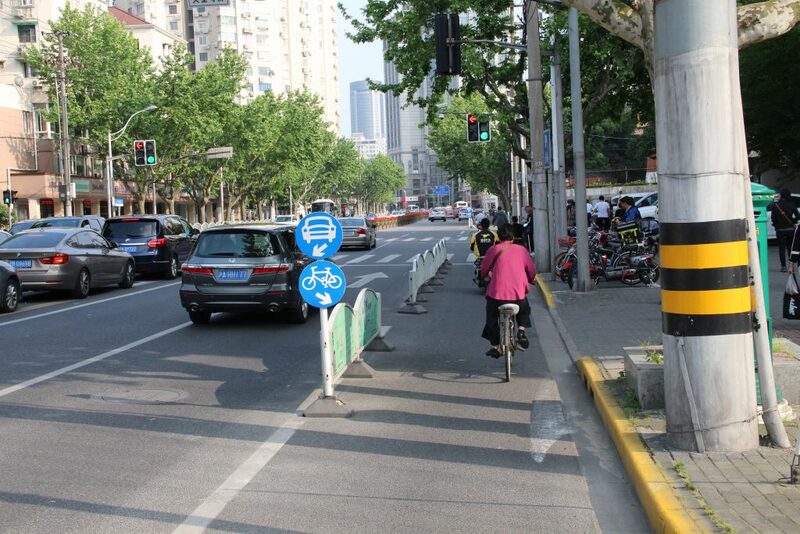 Other systems in Shanghai and Beijing are Bluegogo, U-bicycle and Quick To. Popular as they may be, some local authorities say the bikes have become a nuisance, being dropped virtually everywhere. 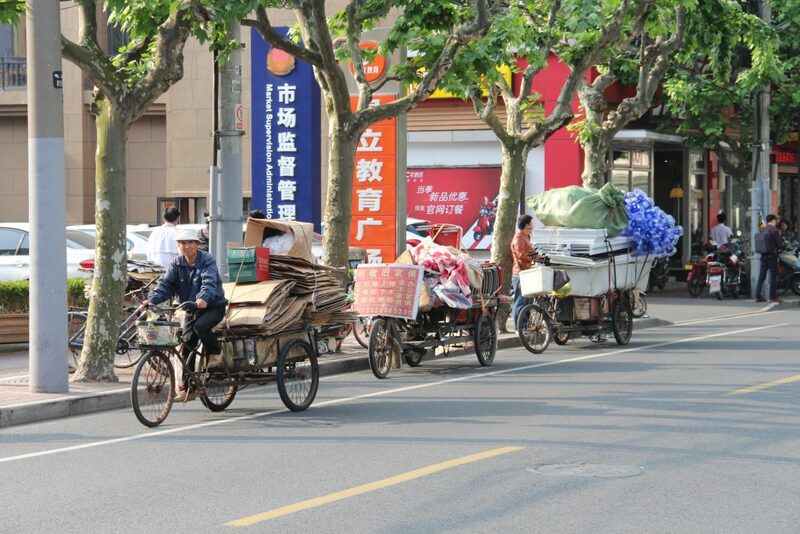 One Shanghai district has confiscated almost 5,000 bikes and impounded them in a parking lot. The images of hundreds of piled up colorful bikes have been popular eye candy in the global media. Mobike has started operating in Manchester, England as their first European City. Other comparable systems have been growing as well. Recently Danish Donkey Republic and Dutch companies Flick Bike and Hello Bike have started in Amsterdam. With the extremities in China in mind, these new systems are greeted in Europe with some scepticism. Several US cities implement strict regulations for companies who want to enter the market (e.g. maximum number of companies, maximum number of bikes, a digital standard). Reward program. Bike sharing companies themselves are trying to reward good behavior of customers. Mobike is using a point system, which rewards chivalry and punishes selfishness and anti social behavior. Using geographical restrictions through the bike smart lock or the smartphone of people using the bike could prove to be an efficient way to limit the range and/or parking possibilities of the bike sharing system. All of these instruments will contribute to new bike sharing initiatives being successful. Hopefully without the extremities of bike sharing in Beijing and Shanghai. Erik studied Urban Planning at the University of Amsterdam and worked as a transportation planner at the Municipality of Haarlemmermeer. Currently he works for the regional transportation organisation of Amsterdam (Vervoerregio Amsterdam). Erik cycled in many cities across the world.